← So What Am I Going to Paint? Well I’ve got some better pics today. Not the best, but certainly an improvement and good enough to show off my average painting. We’ll start with some old paint jobs to illustrate that I was OK at one time. Never award winning by any stretch, but adequate. These first two are both Citadel models. 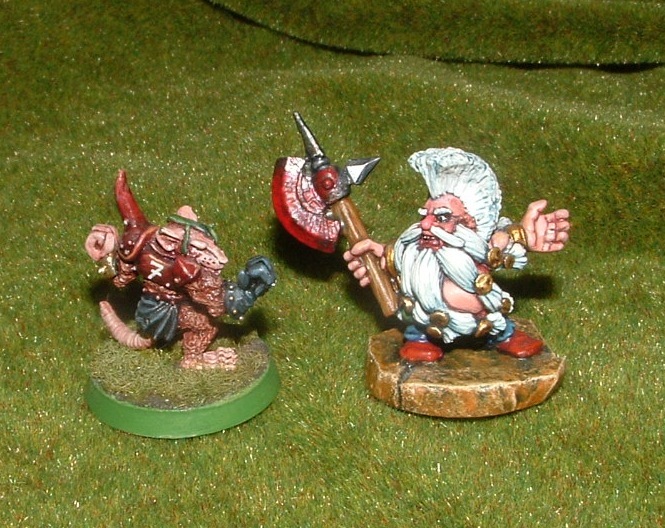 The next two are historical models, both from Foundry and both sculpted by the Perry twins, I believe. The one on the left is an American Civil War foot soldier of no particular unit. 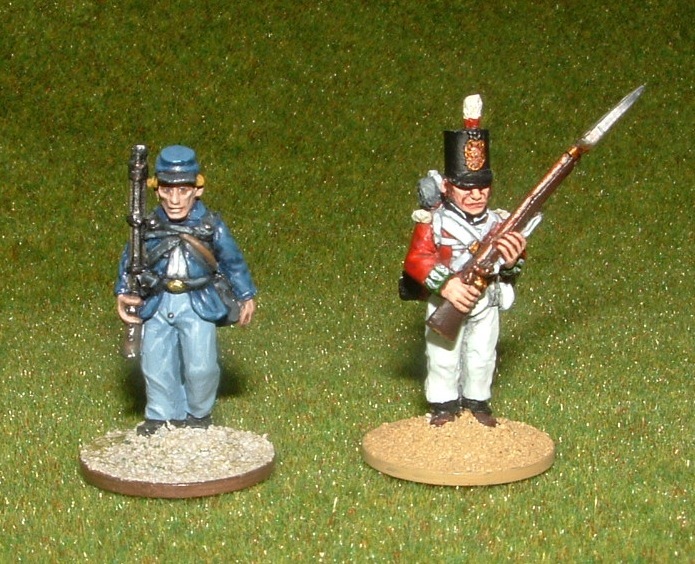 On the right we have a Peninsular War Napoleonic British line infantryman from a centre company of the Nottinghamshire Regiment (green facings, you see). Neither of the bases are finished, for some reason. 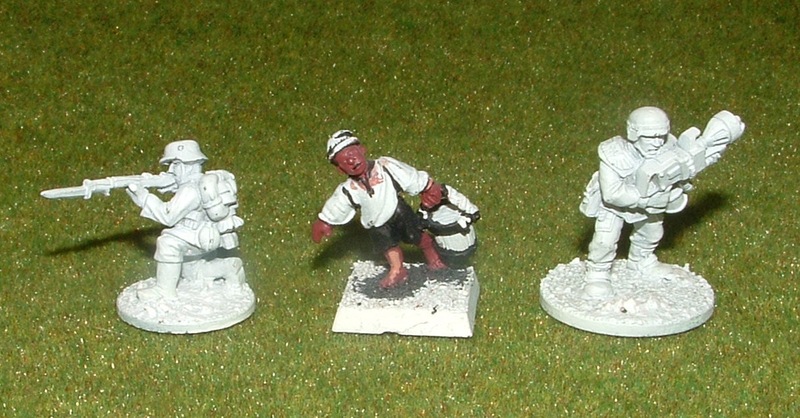 Left top right, we have a Foundry WWI German infantryman, another Foundry model, this time a young lad carrying a bucket (part of an artillery crew), and a Citadel Cadian Shock Trooper from the Imperial Guard. The lad needs a different base and I spotted a mould line I’d missed, but apart from that they’re good to go. You can see the old base colour I used to use for skin on the boy. It’s also obvious from this that I like thin bases, which will be the subject of a different article. 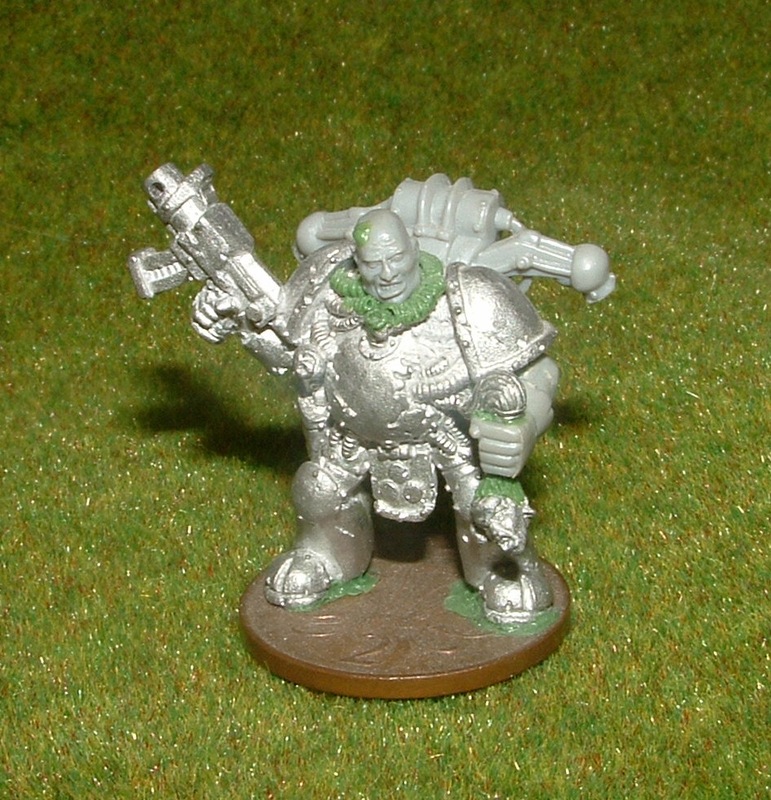 The final one of my models to start with is a conversion of a Plague Marine. I was always rather pleased with the way he came out, though by the time I’d finished him I’d got bored with the game. If I ever went back to 40K it’s a Nurgle army that I’d probably do. This entry was posted in Painting & Modelling. Bookmark the permalink. Those are damn good shots, and the painted minis aren’t bad at all ! Now that I know you can do better (one can only improve at this), I’m eager to see what you’ll come up with ! Looking at the quality of the painting history I would say you tend to be modest. Not that there is anything wrong with that. I looking forward to learning tips that will improve my own efforts. 🙂 It sounds like catching up with you will be a moving target. Thanks Don, that’s very flattering. However I don’t think it’s modesty really. I spent a lot of time working alongside some of the world’s best painters so I know how far I have to go. I also helped to judge quite a few painting competitions so I’ve looked at a great number of armies at tournaments and so on with a critical eye. I used to be a little better than average, perhaps, but than was then and I’m very rusty now. We’ll see over the next few days, weeks and months where I’m at these days. It’ll be fun finding out. I think the plague marine came out very well too. Subtle, if gruesome, and full of grim character. I have a full squad (seven) of plague marines in that exact pose. Now that’s boring, so I haven’t even started to paint them. I’ve been meaning to do *something* with them, but haven’t been able to figure out what. Your conversion is simple, yet very effectful, and the obvious solution. Headswaps, the odd bit of GS, and add some trophies. I can’t wait to see the Plague Marine painted, it looks fantastic already.. I thought it was by far the nicest of the base Plague Marine models (it’s one that Jes Goodwin did as a set of 4, I think – one of each power). However, as you say it’s a static and not very interesting pose, especially when there’s more than one of them. The trophy was half intended to be a blight grenade, and this particular head just seemed to fit really well once I’d taken off the helmet and started rummaging in my bits box. I did another conversion of this model that took the right arm off and turned it so that he was holding the weapon down and across his body, vaguely in the direction this one is looking.